James Madison (Mairch 16, 1751 - Juin 28, 1836) wis the 4nt Preses o the Unitit States frae 1809 tae 1817, when he wis succeedit bi James Monroe. He wis Unitit States Secretar o State unner Thomas Jefferson frae 1801 tae 1809. 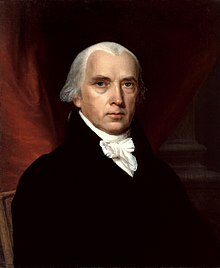 Wikimedia Commons haes media relatit tae James Madison. This page wis last eeditit on 26 Februar 2018, at 23:26.